Pat Ryan, named Tri-County Co-Male Coach of the Year, Metamora High School, and the IHSA state football playoffs have very much in common. As a Redbird quarterback, Ryan directed a Metamora attack that took his team to the quarter-finals twice before losing. And as head coach at his alma mater, he has led his last three teams deep into the tournament, bowing in the semi-finals in 1995 and finishing second in both 1995 and 1997 to New Lennox Providence. Going 13-1 in each of the last two seasons, the rebuilding job he did last season was truly outstanding. Losing his entire offensive line and brilliant offensive threat Jared Grebner from the 13-1 1996 team, he regrouped his team for another 13-1 season and a second consecutive runnerup slot. In his eight seasons at Metamora, Ryan has forged a 67-22 record and has won four Mid-Illini titles and shared a fifth. He attended Eureka College and Southeast Missouri State and began his coaching career under his high school coach, John Helmick, in Carbondale. He then spent three seasons as an assistant at Metamora before becoming head coach in 1990. At age 50, Don Wyss concluded a sensational 35-year career in the Sunday Morning League, the nation's oldest semiprofessional baseball league. He began playing in the league at the age of 15 and for the next 35 years he set records which will never be broken: As a Manager he won eight championships; set astounding career statistics as a hitter, attaining a 35-year batting average of .307; led the League in all-time statistics of most hits, doubles, triples, at bats and runs batted in; and as a pitcher won the pitching honors in 1973 with an 11-2 record. In addition, he served as Vice-President and President of the League for many years. Wyss began his sports career as a three-sport standout at Woodruff High School, playing baseball, basketball, and football. As a high school pitcher, he won 26 games and pitched 4 no-hitters, while attaining a batting average of .424. 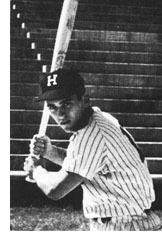 While attending Bradley University, he played on the 1956 baseball team that finished third in the NCAA College World Series and achieved a .323 batting average for the year. Don is presently at Richwoods High School as Dean of Boys and Administrative Assistant. During his 24 years at the school, he has coached three sports and has served as its Athletic Director.